Facilities are faring better in states that expanded Medicaid, according to a new Commonwealth Fund report. A year after facing a federal funding cliff, CHCs in expansion states are thriving. CHCs provide care to 27 million patients each year, according to the Health Resources and Services Administration. The financial stability of CHCs, which serve medically vulnerable communities, is a benefit for health systems. Community health centers (CHC) operating in states that expanded Medicaid under the ACA are 28% more likely to report improvements to their financial stability, according to a Commonwealth Fund report released Thursday morning. CHCs in Medicaid expansion states reported were more likely to report improvements in their ability to provide affordable care to patients, 76%, than their counterparts in non-expansion states, 52%. More than 60% of CHCs in expansion states reported improved ability to fund service or site expansions and upgrades for facilities, while only 46% of CHCs in non-expansion states said the same. These facilities reported higher levels of unfilled job openings for mental health professional and social workers, while also implying a greater openness to operating under a value-based payment model. The success and viability of CHCs are essential for larger health systems, according to Melinda K. Abrams, M.S., vice president and director of the Commonwealth Fund’s Health Care Delivery System Reform program, adding that CHCs act as a strong foundation for providing primary care to medically vulnerable populations in rural communities. Abrams said that by making sure patients are insured and receiving care up front, rather than delaying treatment and exacerbating their condition, they are less likely to end up in a hospital emergency room and contribute to a rise in uncompensated care for hospitals. She also told HealthLeaders that populations with higher enrollment rates make it easier for CHCs to innovate, invest in technology, hire new staff, train existing the workforce, and adopt new models of care. The Commonwealth Fund report provides a welcome note of positivity for CHCs, which serve vulnerable populations primarily composed by the uninsured, but have faced funding challenges in the past. During the budget battles that produced multiple government shutdowns throughout the early portion of 2018, advocates wondered anxiously whether Congress would provide long term funding to the nearly 1,400 CHCs operating at nearly 12,000 service delivery sites across the country. According to the Health Resources and Services Administration, CHCs provide care to more than 27 million patients annually. The Community Health Center Fund (CHCF), created in 2010 as a result of the ACA, is the largest source of comprehensive primary care for medically underserved communities, according to the Kaiser Family Foundation. However, Abrams said that Medicaid expansion has also been a beneficial tool for CHCs, as they have begun to see more insured patients while also benefiting from Medicaid reimbursements, even though they are low compared to other reimbursement rates. CHCs in states that expanded Medicaid have been able to grow the services that are offered while assisting in the ongoing fight against the opioid epidemic, according to the Commonwealth Fund report. Abrams said that one downside to the growing success of CHCs have been the unfilled positions, mostly for mental health providers, that are falling behind rising demand levels, though she added that this finding is not surprising. CHCs are much more likely to participate in value-based payment models as a result of Medicaid expansion, with Abrams explaining that changes in payments and delivery models are common during insurance expansions. She sees the continued progress made on the value-based front by CHCs as a way to “promote better healthcare and save money” over time. Freestanding emergency departments, which provide emergency medical care but are physically separate from hospitals, charge many times more than other providers for the same care, according to a new analysis by UnitedHealth Group. How it works: Freestanding ERs often don’t provide treatment for common emergencies like trauma, strokes and heart attacks, per my colleague Caitlin Owens. Only 2.3% of visits to freestanding emergency departments are for actual emergency care. The number of these facilities increased from 222 in 2008 to 566 in 2016. In Texas, the average cost of treating common conditions at a freestanding emergency department is 22 times greater than treatment at a doctor’s office, and 19 times more than at an urgent care center. If the location of care was changed to one of these cheaper alternatives, it’d save more than $3,000 per visit. Freestanding emergency departments are disproportionately located in affluent areas that have access to other providers, and in Texas, less than one in four receive ambulances. The bottom line: It is much, much cheaper to go see your family doctor if you have a fever — the most common diagnosis at Texas freestanding emergency departments. Mayor Bill de Blasio announced Tuesday a plan to “guarantee health care to all New Yorkers.” Responding to what he described as Washington’s failure to achieve single-payer health insurance, the mayor laid out a “transformative” plan to provide free, comprehensive primary and specialized care to 600,000 New Yorkers, including 300,000 illegal immigrants. “We are saying the word ‘guarantee’ because we can make it happen,” he announced, pledging to put $100 million toward the new initiative. The tendency of a segment of the population to avoid the health-care system until a critical moment, relying in effect on emergency rooms for primary care, has been the knottiest problem in public health for decades. Letting simple problems fester makes them more expensive to treat. Using ERs designed to handle resource-intensive trauma situations for basic medical problems is inefficient and wasteful. The city has spent lots of money trying to convince poor, often dysfunctional people to develop regular medical habits by signing up for Medicaid and getting a primary-care doctor. In 2013, Lincoln Hospital in the Bronx announced a new “Integrated Wellness Program” targeting seriously mentally ill people with chronic health problems—the same population that tends to be uninsured, to neglect their own care, and to wind up in the emergency room when their diabetes or cardiovascular disease catches up with them. “At Lincoln, we aim to establish best practices that combine physical and mental health—two services which have historically been treated separately,” said Milton Nuñez, then as now Lincoln’s director—words not much different from what Chirlane McCray said at Tuesday’s “revolutionary” press conference. Dividing $100 million by 600,000 people comes to about $170 per person—perhaps enough money to cover one annual wellness visit to a nurse-practitioner, assuming no lab work, prescriptions, or illnesses. Clearly, the money that the mayor is assigning to this new initiative is intended for outreach—to convince people to go to the city’s already-burdened public clinics instead of waiting until they get sick enough to need an emergency room. That’s fine, as far as it goes, but as a transformative, revolutionary program, it resembles telling people to call the Housing Authority if they need an apartment and then pretending that the housing crisis has been solved. Mayor de Blasio is an expert at unveiling cloud-castles and proclaiming himself a master builder. His “health care for all” effort seems little different. Vertical integration is all the rage in healthcare these days, with Aetna, Cigna and Humana making notable plays. 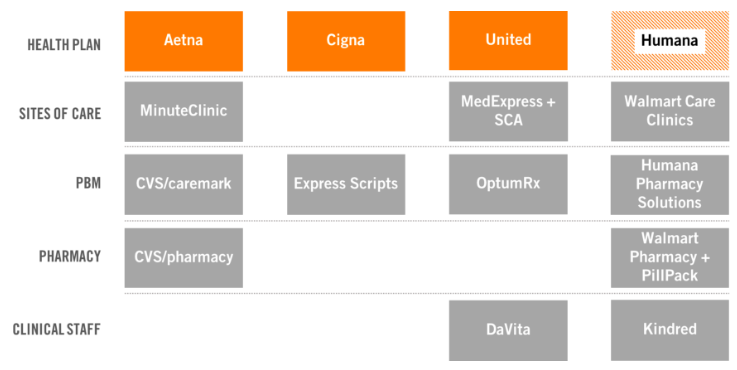 If the proposed CVS-Aetna, Cigna-Express Scripts and Humana-Kindred deals are cleared by regulators, the tie-ups will have to immediately face UnitedHealth Group’s Optum, which has been ahead of the curve for years and built out a robust pharmacy benefit manager (PBM) business already along with a care services unit, employing about 30,000 physicians and counting. UnitedHealth formed Optum by combining existing pharmacy and care delivery services within the company in 2011. Michael Weissel, Group EVP at Optum, told Healthcare Dive the company began by focusing on three core trends in the industry: data analytics, value-based care and consumerism. Since then, the company has been on an acquisition spree to position itself as a leader in integrated services. “For the longest time, the market assumed that they were building the Optum business [to spin it out] and what is interesting in the evolution of the industry is that that combination has now set a trend,” Dave Windley, managing director at Jefferies, told Healthcare Dive. “United has now set the industry standard or trend … to be more vertically integrated and it seems less likely now that United would spin this out … because many of their competitors are now mimicking their strategy by trying to buy into some of the same capabilities,” he said. Weissel said Optum will continue to push on the three identified trends in the next three to five years, with plans to invest heavily in machine learning, AI and natural language processing. The question will be whether and how the company can keep its edge. Optum is a company within UnitedHealth Group, a parent of UnitedHealthcare. Optum’s sister company UnitedHealthcare is perhaps more well known within the industry and with consumers. However, Optum, a venture that encompasses data analytics, a PBM and doctors, has been gradually building its clout at UnitedHealth Group. In 2017, the unit accounted for 44% of UnitedHealth Group’s profits. OptumRx – its pharmacy benefit service. The company focuses on five core capabilities, including data and analytics, pharmacy care services, population health, healthcare delivery and healthcare operations. Services include but are certainly not limited to OptumLabs (research), OptumIQ (data analytics), Optum360 (revenue cycle management), OptumBank (health savings account) and OptumCare (care delivery services). The Eden Prairie, MN-headquartered company has recently expanded its care delivery services, with much of the growth coming from acquisitions. The past two years have seen Optum expand its footprint into surgical care (Surgical Care Affiliates), urgent care (MedExpress) and primary care (DaVita Medical Group). It’s a wide pool, but the strategy affords UnitedHealth the opportunity to grab more revenue by expanding its market presence. For example, the DaVita acquisition, which is still pending, allows OptumCare to operate in 35 of 75 local care delivery markets the company has targeted for development, Andrew Hayek, OptumHealth CEO, said on an earnings call in January. Optum’s strategy of meeting patients where they are and deploying more ambulatory, preventative care services works in concert with its sister company UnitedHealthcare’s goal of reducing high-cost, unnecessary care services, when applicable. If Optum succeeds in creating healthier populations that use lower levels of care more often, that benefits the parent company UnitedHealth Group as UnitedHealthcare spends less money and time on claims processing/payout. The strategy has been paying off so far. Optum’s presence has grown as it has steadily increased its percentage of profits for UnitedHealth Group. 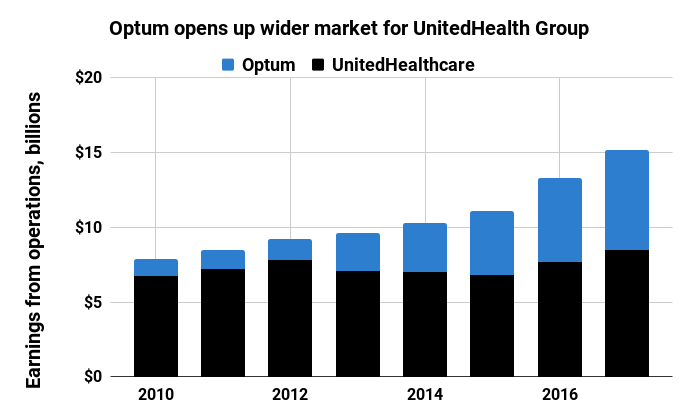 In 2011, the first year Optum was configured as it looks today, the company contributed 14.8% of total earnings through operations to UnitedHealth Group with $1.26 billion. That’s about 29 percentage points lower than in 2017, when Optum brought in $6.7 billion in profits on $83.6 billion in revenue. Broken down, it’s clear that pharmacy services make up the lion’s share of the company’s revenue. In 2017, OptumRx earned $63.8 billion in revenue, fulfilling 1.3 billion prescriptions. 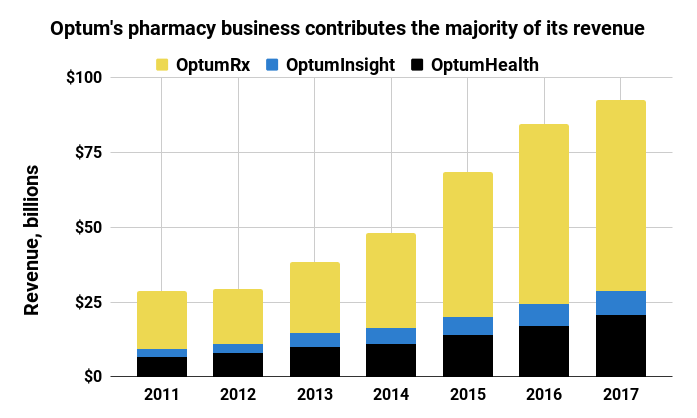 OptumRx’s contributions to the company took off in 2015 when Optum acquired pharmacy benefit manager Catamaran. In recent years, OptumHealth has grown due to expansion in care delivery services, including consumer engagement and behavioral and population health management. The care delivery arm served 91 million people last year, up from 60 million in 2011. 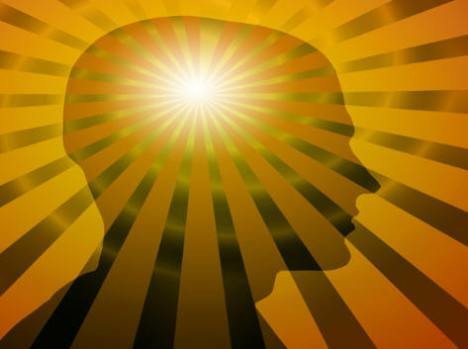 OptumInsight has grown largely due to an increase in revenue cycle management and operations services in recent years. On Wall Street, UnitedHealth Group is performing well and has seen healthy growth since 2008. 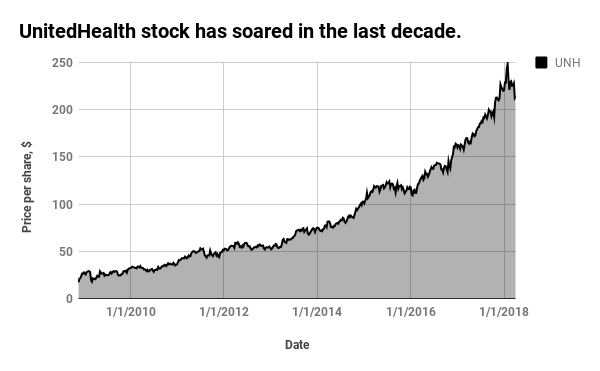 The stock peaked in January and took a dive when Amazon, J.P. Morgan and Berkshire Hathaway — industry outsiders yet financial giants — announced they would create a healthcare company. While these charts suggest a dominant force, the stock activity shows that investors believe there’s still more room for competition, if the new entrants play their cards right. UnitedHealth started down this strategic path many years ago and the rest of the industry just now seems to be catching up. Perhaps oddly, its largest revenue contributor, OptumRx, seems to have the largest vulnerability for competition in the coming years. Optum’s competitive advantage in the PBM space is driven largely by already realized integration. Merging data across IT systems is no easy task, and Optum has spent years harmonizing pharmacy data across platforms to assist care managers in OptumCare to see medical records for United members. Anyone with experience implementing EHR systems can tell you such integration doesn’t happen over night. If the Cigna-Express Scripts deal closes, the equity can compete with OptumRx, but the technology investment needed to harmonize data and embed Cigna’s service and pharmacy information into Express Scripts servers will take time, Windley said. Optum, on the other hand, has invested in the effort and integration for years. Gupte says the encroaching organizations in the PBM space have the ability to realize the efficiencies and savings and the integrated medical that Optum has been realizing across OptumRx and the managed care organization. Optum’s leg up in PBM space could last two to three years over the competition, she said. On the care delivery side, OptumHealth has been purchasing large physician groups for a variety of services. There are only so many large physician groups putting themselves on the market, and Optum has been making bids for them. Even if CVS-Aetna closes, OptumCare is a $12 billion business with many urgent and surgery care access points. If CVS-Aetna is finalized, the company will have about 1,100 MinuteClinics capable of realizing efficiencies with Aetna, but, as Windley notes, they likely won’t have primary care or surgery care elements. There’s also a lot of time and capital needed for building out and retrofitting retail space to medical areas. Urgent care has the potential for outsider competition, she added. However, Optum is using its MedExpress business to treat higher acuity conditions and have an ER doctor on staff in each center. Compared to the typical types of conditions treated in retail clinics or those that would be feasible over time, Gupte believes services that could be seen in CVS or Walmart would be lower acuity, chronic care management services. One potential issue will be harmonizing the disparate businesses so patients can be effectively managed across the various organizations, Trevor Price, founder and CEO of Oxean Partners, told Healthcare Dive. Optum will continue to explore ground in the three core trends it has identified. Out of the three, consumerism has the longest path to maturity in healthcare, Weissel said, adding he believes consumerism is going to change healthcare more than any other trend over the next decade. That means the company is putting bets into the marketplace around consumer building and segmentation models as well as thinking about how to connect data to allow patients to schedule appointments, view health records, sign up for insurance, search for providers or renew prescriptions online. Consumer-centric projects currently underway include digital weight loss programs — including streaming fitness classes — and maternity programs to track pregnancy. The company is also experimenting with remote patient monitoring to understand the impacts on those with heart disease or asthma and to search for service opportunities. Optum will pursue investments as well as acquisitions to push into the consumer space. In this new medical age of urgent care centers and retail clinics, that’s not a simple question. Nor does it have a simple answer, as primary care doctors become increasingly scarce. “You call the doctor’s office to book an appointment,” said Matt Feit, a 45-year-old screenwriter in Los Angeles who visited an urgent care center eight times last year. “They’re only open Monday through Friday from these hours to those hours, and, generally, they’re not the hours I’m free or I have to take time off from my job. That’s one reason big players like CVS Health, the drugstore chain, and most recently Walmart, the giant retailer, are eyeing deals with Aetna and Humana, respectively, to use their stores to deliver medical care. People are flocking to retail clinics and urgent care centers in strip malls or shopping centers, where simple health needs can usually be tended to by health professionals like nurse practitioners or physician assistants much more cheaply than in a doctor’s office. Some 12,000 are already scattered across the country, according to Merchant Medicine, a consulting firm. On the other side, office visits to primary care doctors declined 18 percent from 2012 to 2016, even as visits to specialists increased, insurance data analyzed by the Health Care Cost Institute shows. There’s little doubt that the front line of medicine — the traditional family or primary care doctor — has been under siege for years. Long hours and low pay have transformed pediatric or family practices into unattractive options for many aspiring physicians. And the relationship between patients and doctors has radically changed. Apart from true emergency situations, patients’ expectations now reflect the larger 24/7 insta-culture of wanting everything now. When Dr. Carl Olden began watching patients turn to urgent care centers opening around him in Yakima, Wash., he and his partners decided to fight back. They set up similar clinics three years ago, including one right across the street from their main office in a shopping center. The practice not only was able to retain its patients, but then could access electronic health records for those off-site visits, avoiding a bad drug interaction or other problems, said Dr. Olden, who has been a doctor for 34 years. By opening clinics to compete with urgent care centers, Dr. Carl Olden’s practice in Yakima, Wash., was able to retain its patients and move some walk-ins into the fold. The new deals involving major corporations loom over doctors’ livelihoods, intensifying pressure on small practices and pushing them closer to extinction. The latest involves Walmart and Humana, a large insurer with a sizable business offering private Medicare plans. While their talks are in the early stages, one potential partnership being discussed would center on using the retailer’s stores and expanding its existing 19 clinics for one-stop medical care. Walmart stores already offer pharmacy services and attract older people. In addition, the proposed $69 billion merger between CVS Health, which operates 1,100 MinuteClinics, and Aetna, the giant insurer, would expand the customer bases of both. The deal is viewed as a direct response to moves by a rival insurer, UnitedHealth Group, which employs more than 30,000 physicians and operates one of the country’s largest urgent-care groups, MedExpress, as well as a big chain of free-standing surgery centers. While both CVS and UnitedHealth have large pharmacy benefits businesses that would reap considerable rewards from the stream of prescriptions generated by the doctors at these facilities, the companies are also intent on managing what type of care patients get and where they go for it. And the wealth of data mined from consolidation would provide the companies with a map for steering people one way or another. On top of these corporate partnerships, Amazon, JP Morgan and Berkshire Hathaway decided to join forces to develop some sort of health care strategy for their employees, expressing frustration with the current state of medical care. Their announcement, and Amazon’s recent forays into these fields, are rattling everyone from major hospital networks to pharmacists. Doctors, too, are watching the evolution warily. Dr. Susan Kressly, a pediatrician in Warrington, Pa., has watched patients leave. Parents who once brought their children to her to treat an ear infection or check for strep, services whose profits helped offset some of the treatments she offered, are now visiting the retail clinics or urgent care centers. What is worse, some patients haven’t been getting the right care. “Some of the patients with coughs were being treated with codeine-based medicines, which is not appropriate at all for this age group,” Dr. Kressly said. Even doctors unfazed by patients going elsewhere at night or on weekends are nervous about the entry of the corporate behemoths. Nurse practitioners allow Dr. Purifoy to offer more same-day appointments; he and two other practices in town take turns covering emergency phone calls at night. And doctors keep facing new waves of competition. In California, Apple recently decided to open up its own clinics to treat employees. Other companies are offering their workers the option of seeking medical care via their cellphones. Investors are also pouring money into businesses aiming to create new ways of providing primary care by relying more heavily on technology. Dr. Mark J. Werner, a consultant for the Chartis Group, which advises medical practices, emphasized that convenience of care didn’t equal quality or, for that matter, less expensive care. “None of the research has shown any of these approaches to delivering care has meaningfully addressed cost,” Dr. Werner said. Critics of retail clinics argue that patients are given short shrift by health professionals unfamiliar with their history, and may be given unnecessary prescriptions. But researchers say neither has been proved in studies. Still, while the retail clinics over all charge less, particularly compared with emergency rooms, they may increase overall health care spending. Consumers who not long ago would have taken a cough drop or gargled with saltwater to soothe a sore throat now pop into their nearby retail clinic for a strep test. Frustration with the nation’s health care system has fueled a lot of the recent partnerships. Giant companies are already signaling a desire to tackle complex care for people with a chronic health condition like diabetes or asthma. “We’re evolving the retail clinic concept,” said Dr. Troyen A. Brennan, the chief medical officer for CVS. The company hopes its proposed merger with Aetna will allow it to transform its current clinics, where a nurse practitioner might offer a flu shot, into a place where patients can have their conditions monitored. “It requires new and different work by the nurse practitioners,” he said. Dr. Brennan said CVS was not looking to replace patients’ primary care doctors. “We’re not trying to buy up an entire layer of primary care,” he said. But people will have the option of using the retail clinic to make sure their hypertension or diabetes is well controlled, with tests and counseling provided as well as medications. The goal is to reduce the cost of care for what would otherwise be very expensive conditions, Dr. Brennan said. If the company’s merger with Aetna goes through, CVS will initially expand in locations where Aetna has a significant number of customers who could readily go to CVS, Dr. Brennan said. UnitedHealth has also been aggressively making inroads, adding a large medical practice in December and roughly doubling the number of areas where its OptumCare doctors will be to 75 markets in the United States. It is also experimenting with putting its MedExpress urgent care clinics into Walgreens stores. Big hospital groups are also eroding primary care practices: They employed 43 percent of the nation’s primary care doctors in 2016, up from 23 percent in 2010. They are also aggressively opening up their own urgent care centers, in part to try to ensure a steady flow of patients to their facilities. One Medical has centers in eight cities with 400 providers, making it one of the nation’s largest independent groups. HCA Healthcare, the for-profit hospital chain, doubled its number of urgent care centers last year to about 100, according to Merchant Medicine. GoHealth Urgent Care has teamed up with major health systems like Northwell Health in New York and Dignity Health in San Francisco, to open up about 80 centers. “There is huge consolidation in the market right now,” said Dr. Jeffrey Le Benger, the chief executive of Summit Medical Group, a large independent physician group in New Jersey. “Everyone is fighting for the primary care patient.” He, too, has opened up urgent care centers, which he describes as a “loss leader,” unprofitable but critical to managing patients. Eva Palmer, 22, of Washington, D.C., sought out One Medical, a venture-backed practice that is one of the nation’s largest independent groups, when she couldn’t get in to see a primary care doctor, even when she became ill. After paying the annual fee of about $200, she was able to make an appointment to get treatment for strep throat and pneumonia. “In 15 minutes, I was able to get the prescriptions I needed — it was awesome,” Ms. Palmer said. Patients also have the option of getting a virtual consultation at any time. By using sophisticated computer systems, One Medical, which employs 400 doctors and health staff members in eight major cities, allows its physicians to spend a half-hour with every patient. Dr. Navya Mysore joined One Medical after working for a large New York health system, where “there was a lot of bureaucracy,” she said. She now has more freedom to practice medicine the way she wants and focus more on preventive health, she said. By being so readily available, One Medical can reduce visits to an emergency room or an urgent care center, said Dr. Jeff Dobro, the company’s chief medical officer. As primary care doctors become an “increasingly endangered species, it is very hard to practice like this,” he said. But more traditional doctors like Dr. Purifoy stress the importance of continuity of care. “It takes a long time to gain the trust of the patient,” he said. He is working with Aledade, another company focused on reinventing primary care, to make his practice more competitive. One longtime patient, Billy Ray Smith, 70, learned that he needed cardiac bypass surgery even though he had no symptoms. He credits Dr. Purifoy with urging him to get a stress test. “If he hadn’t insisted,” Mr. Smith said, “it would have been all over for me.” Dr. Purifoy’s nurse routinely checks on him, and if he needs an appointment, he can usually see the doctor that day or the next. “I trust him 100 percent on what he says and what he does,” Mr. Smith said. Yesterday the Center for Medicare & Medicaid Services (CMS) finalized the 2019 Physician Fee Schedule (PFS), announcing they will delay implementation of changes to physician evaluation and management (E&M) codes until 2021. CMS had proposed to collapse five E&M codes into two, and to streamline physician documentation requirements. The delay is a win for the thousands of physicians who submitted comments opposing the changes, complaining that the proposal would penalize doctors who see more complex patients. Doctors also expressed concern that the rates assigned to the proposed codes were too low, discouraging doctors from seeing Medicare patients and creating access challenges. Along with the two-year delay, CMS also raised base rates, and created an additional code for complex visits. These changes are a win for doctors—and provide time for continued lobbying to permanently forestall implementation. The 2019 rule also includes several other noteworthy changes that were largely lost in hubbub surrounding E&M visit coding, most of which will be well-received by doctors. At the top of our list: CMS significantly expanded telemedicine coverage, and will now reimburse for telemedicine and telephone visits for brief check-ins, evaluation of patient-submitted images or remote monitoring data, as well as more comprehensive and preventive care visits. This is a substantial step toward increasing access for the two-thirds of Medicare beneficiaries who are ineligible for telemedicine coverage today. We will be continuing to make our way through the details of the rule, and sharing our thoughts on its impact for doctors and health systems. In the longer term, it is worth watching whether continued pressure from doctors postpones further action, and whether the administration will enact changes that could upset the physician base—significantly, the 2021 PFS rule will likely drop in the weeks just before the 2020 Presidential election.